If you are planning to upgrade the look of your property, we highly recommend adding outdoor fireplaces and fire pits. These highly sought-after outdoor amenities are guaranteed not only to make your outdoor area look more inviting to spend time at, but will also provide additional comfort that your family and guests will surely appreciate. Outdoor fireplaces are indispensable amenities especially during the winter months or cold nights. As it is, it can be very uncomfortable to stay outdoors during such weather because of the unforgiving cold. With these fire features, staying outside to stargaze or hold bonfires can be bearable with the warmth brought by the fire. Additionally, these outdoor amenities add market value to your property. Potential property buyers tend to look for property listings with added amenities like outdoor fireplaces. So in effect, your decision to have a fireplace installed in your outdoor area is also a wise economic move should you eventually decide to sell your property. Here at Brick by Brick Pavers and Landscaping, we can install durable and stunning outdoor fireplaces to your outdoor areas. We use top quality stone and other durable fireplace materials. We can even provide additional amenities like an outdoor sofa or dining set so you can just sit back and lounge comfortably beside your outdoor fireplace. Just like fireplaces, outdoor fire pits also provide warmth and comfort during extremely cold weather. These amenities are only smaller than fireplaces and are therefore relatively easier to install. These fire features will allow you and your family to enjoy a cup of coffee or tea as you share stories about your day at the office or school. In fact, you can even grill food or toast some marshmallows using our outdoor fire pits. The good thing about our fire pits is that they not only provide you very useful benefits, they will also look great on your outdoor area. 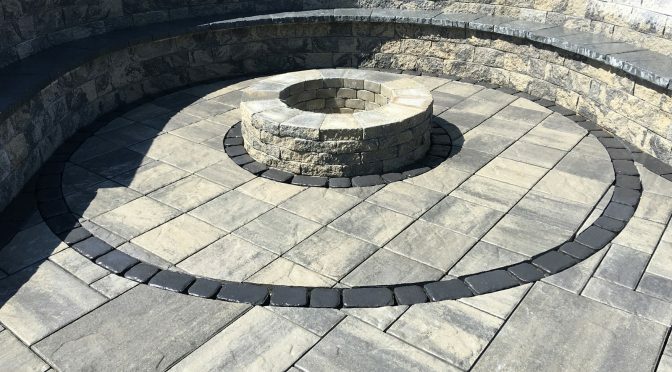 This is because our skilled masons use only premium block and other building materials to create outdoor fire pits that are sure to complement and enhance the look of your existing indoor and outdoor structures. We only offer premium outdoor fireplaces and fire pits. We know that our New Jersey clients want durable and stunning fire features for their properties. That’s why we partnered with Techo-Bloc, the premier manufacturer of paving stone in North America. Techo-Bloc has some stunning designs and premium quality masonry blocks that are guaranteed to last for years. The same company also provides other value for money products like Valencia fire bowl kit and foyer outdoor fireplace. These products guarantee easy installation, elegant look, and optimum comfort during cold weather. The best thing is that these fire features are installed in your property by our expert masons. These workers have the skills and experience in installing outdoor fireplaces and fire pits that are guaranteed to last for decades with very minimal maintenance efforts needed. So if you want to beautify your outdoor area and improve your family’s outdoor experience, all you have to do is contact us today to ask for these amazing outdoor amenities.